Break 10 oz of milk chocolate candy bars into small pieces & melt over low heat. Remove & cool for several minutes. Fold in 2/3 a carton of whipped topping & mix well. Stir in 3/4 cup of chopped pecans & pour into a 9-inch frozen piecrust that has been cooked. 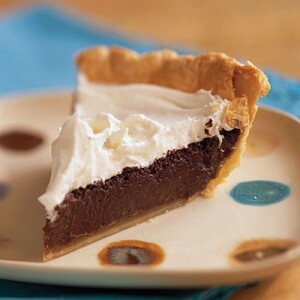 Spread the remaining whipped topping over the top of the pie.